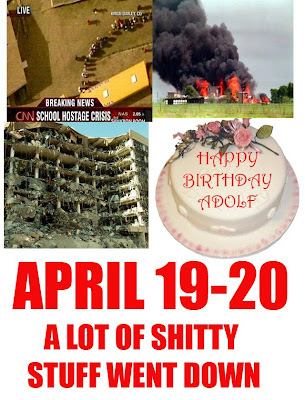 Stark anniversaries all around this weekend with April 19th and April 20th marking the Columbine massacre, Waco, the bombing of the Federal Building in Oklahoma and the births of Hitler and Joey Lawrence. Whoa- that’s a lot of crap that went down on these two days. Sorry to ruin your buzz, 4/20 weed enthusiasts.